Prosthetics have advanced from the simplistic apparatuses of only several decades ago to today’s complex interfaces of devices and biological systems that are designed to resemble missing body parts and replicate their functions. They have set their sights beyond making refinements and improvements. They are eyeing big leaps forward in expanding the capabilities of prosthetics technologies. Projects in which Arizona State University engineers are collaborating are among those aiming at nothing less than revolutionary steps in hand prosthetics. Professor Marco Santello and his research colleagues want to help break through the functionality barriers that still persistently burden people with artificial hands. Santello is the director of the School of Biological and Health Systems Engineering, one of ASU’s Ira A. Fulton Schools of Engineering, and a neurophysiologist who directs the Neural Control of Movement Laboratory at the university. Despite all the technological advances to date, he explains, there remain several barriers to be overcome to empower individuals who have lost limbs to regain a level of function with prostheses that they can be fully satisfied with. One such barrier is lack of sensory feedback. “Users of commercially available prostheses still must always look at what the artificial hand is doing to be able to properly control it, because current technology cannot fully compensate for the lack of feedback when, for instance, a user is touching or manipulating an object,” Santello said. Working with researchers at the Mayo Clinic, the Italian Institute of Technology and Florida International University, Santello and ASU colleagues Qiushi Fu and James Abbas are applying some of the latest advances in bioengineering, robotics and brain-machine interface systems to development of prosthetic hands that enable users to feel sensations by which they can judge how much or how little force to exert in gripping, lifting, moving and holding particular objects. With new technologies that directly connect with the body’s nervous system, they hope to provide feedback by using mechanical or electrical stimuli that can send task-relevant information to the brain by exerting pressure on the skin or stimulating peripheral nerves. Such a feedback loop would give artificial hand users the critical information to enable performance of a wide range of normal daily living activities. The challenge is to construct a seamless integration of the nervous system with a myoelectric prosthetic hand — one that is controlled by electrical signals generated naturally by one’s muscles. It’s a task that requires teams of researchers with a broad range of complementary expertise in various branches of engineering, neuroscience and medical science. • Kristin Zhao and Karen Andrews in the Department of Physical Medicine and Rehabilitation at the Mayo Clinic in Rochester, Minnesota. Zhao is the director of the Assistive and Restorative Technology Laboratory. Andrews directs the Amputee Clinic. In various combinations, they are fellow principal investigators or co-principal investigators on three prosthetics research projects for which Santello has been awarded grants in the past two years. The National Institutes of Health have been funding work to identify strengths and weaknesses of a “synergy-based artificial hand” — designed by Bicchi and collaborators — through a variety of tests involving grasping and manipulation tasks. Part of this work has been carried out at the Mayo Clinic in Rochester, Minnesota. Research aimed at optimizing the integration of sensory feedback into prosthetics to control movement and manipulation is supported by a joint ASU-Mayo Clinic Team Science Seed Grant. The project focuses on testing non-invasive feedback systems for hand prostheses and users’ adaptation to integrating artificial feedback with prosthesis control. A project funded by the Defense Advanced Research Projects Agency, a part of the U.S. Department of Defense, teams Santello, Abbas and Fu with Jung and her team at Florida International University. Jung, Abbas and their team have developed a new neural-enabled system that uses implanted electronics to provide tactile sensation to amputees based on information derived from sensors on a prosthetic hand. 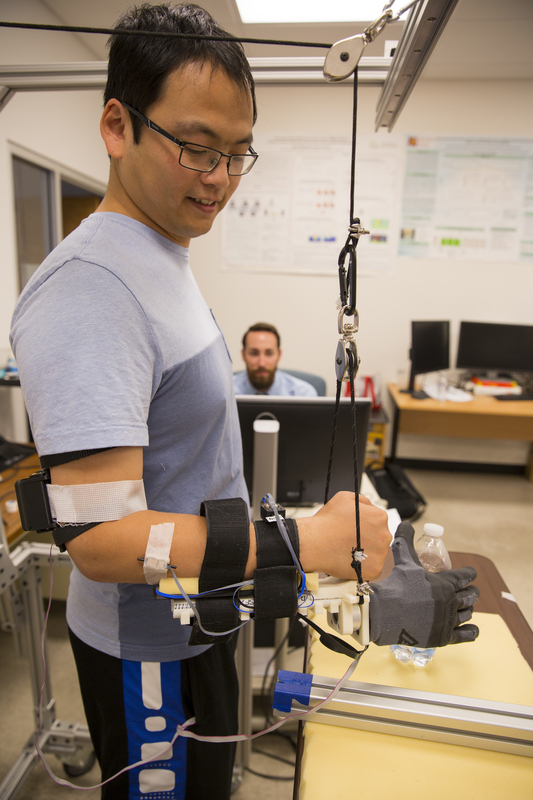 Santello and Fu will team with Jung and Abbas to test the “synergy-based artificial hand” using the implanted neural-enabled system for sensory feedback. Through these varied but related endeavors, Santello sees the potential for a new wave of easier-to-control prosthetics technologies with more durability and more robust functionality. For people using artificial hands that means having prosthetics that feel real — ones that are highly sensitive to pressure, force, vibration and texture, with a full range of movement and grasping ability, and controlled through the same natural intuitive actions and reactions that we use to control our muscles. More help in solving those problems could come by way of Santello’s role as the ASU principal investigator in the BRAIN Center (Building Reliable Advances and Innovation in Neurotechnology), a recently established National Science Foundation Industry/University Cooperative Research Center. Led by ASU and the University of Houston, the BRAIN Center focuses on developing and testing new neural technologies with the potential to dramatically enhance patient treatment and functional capabilities. The work supported by the BRAIN center, which will involve industry and clinical partners, includes testing technologies designed to improve a wide range of the sensory, motor and cognitive functions, such as those that researchers want to put into new kinds of prosthetic devices. In town for the solar eclipse? ASU has you covered. If, like Mick Jagger and the Rolling Stones, you want to see the sun blotted out from the sky and painted black, then you are in luck. Your wish will be granted Monday when the first coast-to-coast total solar eclipse in 99 years will occur. Total eclipses are rare. While the entire population of North America will be able to see a partial eclipse, only those in a 70-mile-wide curved stripCarbondale, Ilinois, is expected to have the greatest point of duration for the 2017 total solar eclipse: two minutes and 40 seconds. from Oregon to the Carolinas will see the sun completely blotted out by the moon. For those without the time to drive to Wyoming, drive to Tempe instead. Arizona State University’s School of Earth and Space Exploration is hosting a free eclipse-viewing celebration on campus with solar telescopes and solar-safe viewing glasses (more details at the end of this story). Here's a look at some interesting facts about eclipses — along with some thematic titles for your eclipse-day playlist. “I was fortunate enough to see a total eclipse in Europe in 1999, and words can't do justice to the experience of totality. The moon will cover part of the sun's disk. It will get noticeably darker if there is a reasonable amount of coverage, and it's an impressive thing to see with proper eye protection,” Young said. Young, an associate professor in ASU’s School of Earth and Space Exploration, will be among the scientists traveling to Idaho to witness the totality of the eclipse in all its splendor. The awesomeness of an eclipse has long spun tales of enchantment and sensation. An inexplicable occurrence in ancient times, an eclipse would often trigger bewilderment and fear for those in its path. Simonton notes that some, like Alexander the Great, rendered obedience to eclipses in the context of a religious phenomenon and responded with appropriate ritual action such as sacrifice. Such events became part of a people's history. A solar eclipse, or a bright bursting star, would be memorized as part of the history of a king or queen’s reign and passed down in the oral tradition to succeeding generations, Adamson said. Anne Neville, the wife of British monarch Richard III, died on March 16, 1485 — an eclipse day according to NASA’s log of 15th-century eclipses. Some believed Neville’s death on the day of the eclipse was an omen of her husband’s controversial reign. There are, however, a great number of historians who say Neville probably died of tuberculosis. Beyond almanacs and histories, in science fiction eclipses often serve as a way to reveal humanity’s place in the cosmos. Ed FinnFinn is also an assistant professor with a joint appointment in the School of Arts, Media and Engineering and the Department of English., founding director of ASU's Center for Science and the Imagination, cites Isaac Asimov's short story “Nightfall,” about a civilization that lives in permanent sunlight. Every 2,000 years the civilization collapses because of a cyclical total solar eclipse. A team of scientists prepare themselves for the coming darkness, but they did not predict the impact of seeing millions of stars for the first time, a sight so overwhelming that they succumb to madness. “The story illustrates how powerful a change of perspective can be, reminding us of the palpable reality of bodies in space and also the incredible vastness of the universe over our heads,” Finn said. With apologies to super fans of Pink Floyd, there isn’t really a “dark side of the moon” as the title of the classic rock band’s 1973 album suggests. That’s because one side of the moon is always lit by the sun; it’s just not always the side that’s facing the Earth. However, '80s music fans will have reason to celebrate Duran Duran’s 1984 pop hit “New Moon on Monday” because the moon must be in its new-moon phase for a solar eclipse to occur. And this year that special eclipse new moon will happen on a Monday, Duranies. The fact that total eclipses occur at all is due to a cosmic coincidence, said ASU astronomer Jenny Patience. According to NASA, solar eclipses only occur if the moon “is located within 0.5 degrees of the plane of the ecliptic, on a line that passes through the center of the sun and the Earth. The moon travels along an orbit that is inclined by five degrees to the ecliptic plane, so there are only two opportunities each month when it passes through the plane of the ecliptic” at points called the ascending and descending nodes. Eclipses of the sun, according to NASA, only occur if the new-moon phase is near one of these nodes, which is why there is not a solar eclipse with every new moon. Patience, who is an associate professor in the School of Earth and Space Exploration, specializes in the study of exoplanets, planets outside our solar system. Eclipses also occur around other stars, she said. “Using telescopes to search for those distant eclipses is one way that exoplanets are discovered in orbit around other stars,” she said. Students from ASU’s NASA Space Grant program will be in eastern Wyoming to track the eclipse during its path of totality. Led by Professor Tom Sharp of ASU’s School of Earth and Space Exploration, the students will team up with Embry-Riddle Aeronautical University and the group Arizona Near Space Research to launch high-altitude balloons to view the eclipse. The student-led project is a first for tracking a solar eclipse. Sharp says the students came up with the plan for their experiments and designed the payload structure, electronics and sensor rays to make the planned observations and measurements. NASA will also be live-streaming video from other space-grant balloon projects taking part in the experiment all across the country. Like a great number of eclipse chasers across the country, ASU students participating in the high-altitude experiment in Wyoming will be camping under the stars — and the moon — for the Great American Eclipse. Lodging in the eclipse’s path of totality is next to sold out in many towns across the country, and many local merchants are banking on the 2017 eclipse to boost business in small towns. For those unable to travel out of state to witness the eclipse in its path of totality, ASU’s Tempe campus is opening up Hayden Lawn and the Interdisciplinary Science and Technology Building IV to the public. Join the Sun Devil community in staring at the sun in its partially eclipsed state through solar telescopes and free ASU solar-safe viewing glasses — while supplies last. A note about viewing: Experts constantly remind us that we should never look directly at the sun during an eclipse without protective eyewear — and regular sunglasses won’t cut it. NASA recommends eclipse glasses that meet a particular standard, ISO 12312-2, which provides the protection your eyes need from harmful light. Have questions on the day of the eclipse? Experts also will be on hand at ASU on Eclipse Day 2017 to answer them. What: ASU's School of Earth and Space Exploration is hosting an eclipse-viewing experience with solar telescopes, solar-safe viewing glasses, live NASA coverage of the event and interactive displays. When: 9 a.m.-noon Monday, Aug. 21. Where: Hayden Lawn or in Interdisciplinary Science and Technology Building IV on ASU's Tempe campus. Admission: Free. A limited number of eclipse glasses will be available for free as well. ASU Now reporters Scott Seckel and Emma Greguska contributed to this story.